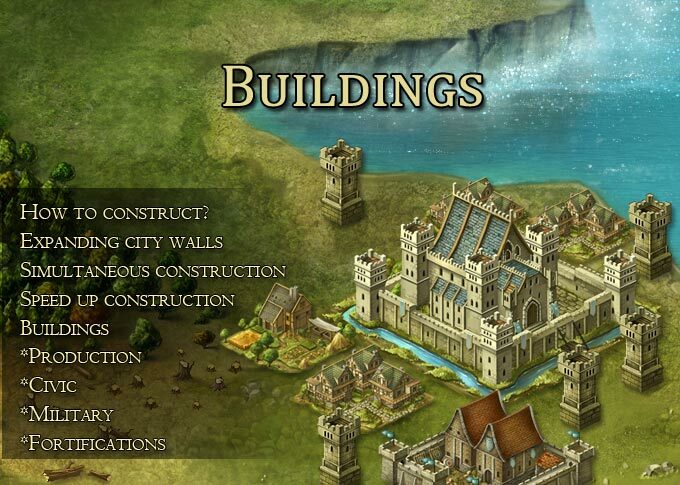 There are four types of buildings in the game; Civic, military, production and fortifications. You have to construct everything except fortifications - which you already start with, and can upgrade to bolster your defenses. Construction is pretty much your bread and butter - while you can focus more on fighting and conquere them instead of buildingt everything your self. Those of you who love pummeling your enemies into submission would have to bother with construction less. All crucial development features are based in the capital - so losing cities won’t stop you from researching and arming your units. Expansions are mostly about income and strategic map positioning. The Buildings menu appears in the right corner at the bottom of the screen after clicking on opens/closes the menu. Production: includes all buildings of resources production. Civic: includes the most important constructions in the city like palace, university and market. 2. Enough resources by assigning workers. To start construction, just choose the building that you want and drag it to inside your city and make sure you release it in the green area. You can expand you city by opening the build menu and selecting one of the area you wish to expand. You pay for expansions as any build project. There are 2 building slots for a city and you can have maximum of 1 waiting queue. The second construction slot you get by simply doing quests. Building processes can be finished instantly. Simply click on the building and select to finish now. The amount of gemstones required for instant building differs depending on the time you wish to skip. The places where you people, work, play and store the goods of the city. The more lively spots in the city, each having its own specific role. Houses simply provide a place for people to settle in. Population growth rate is independent of housing and farms. When you run out of living spaces, the city starts to gather homeless people, they can work, be trained as troops and pay taxes as soon as they get a place to live. They cost nothing and are simply there to preserve population growth instead of cutting it to 0 when your have no room for more people. Farms directly feed the population and provide food reserves for the army. When you run out of farms to feed the people, population growth stops. The food in your storages is for military purposes only, the people are fed separately. Running out of storage space in a city halts production from the mines. You can transfer resources to a city with full storage and they will be received. Get people working in it and they will produce wood. * There is a total capacity of 9 mines per city, you can have different counts of each type to suit your preference. Get people working in it and they will produce stone. Get people working in it and they will produce iron. Across the empire - unlocks researches that improve economy and military. Across the empire - improves the damage, life, speed and cargo capacity of each unit type. Choose between different rituals to boost your economy and military. Allows you to sell and buy resources. Barracks upgrades allow you to train more units, increases their damage and lowers units price. Takes wood returns crafted wood that bash city walls. The more you have the better the costs and crafting speed of machines. Make sure you have something left after you get robbed. Prevents selected troops from being attacked. Deals damage to incoming enemies. The pile of blockage that stands between you and the enemy.